Alan Robertson, bond trader, scuba diver, bird watcher, opera lover, reader of anything and everything. He lead a life as varied as his interests. He died November 1, 2017, at his Seattle home at age 85. He was born in San Francisco and grew up in San Marino, attending South Pasadena High School where he was an all-league center on the school's 1949 league champion football team. During summers he dug swimming pools, laid pipe, finished concrete, sold Jamison shingles and worked on an oil rig. 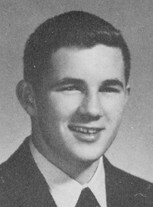 Al attended Stanford University on a football scholarship and joined Zeta Psi fraternity along with high school friends. Sidelined by football injuries, he turned reluctantly to his education, majoring in political science. After graduating in 1954, Al joined the Army Securing Agency. He attended Language School in Monterey and learned to speak Russian, beginning his lifelong interest in languages. In 1956, after additional training at Fort Devens, Massachusetts, in methods to intercept Russian transmissions, Al was sent to Bad Aibling near Passau, Germany. After returning to civilian life, he married Diane Derosier, a young artist he'd met while stationed at Fort Devens. They returned to Pasadena where they raised their family, spending many weekends at the beach skin diving, scuba diving and bird watching. Al began his career in the investment business in Los Angeles, selling stocks and bonds, but soon learned he was not interested in 'cold calling.' He moved to First Western Bank as a loan officer and later started his own financial services business providing loans to local produce farms. After recovering from a serious battle with cancer in 1966, Al was recruited by Blyth & Company in Los Angeles to train their brokers to sell municipal bonds. An opening at Blyth's Seattle office in 1972 brought Al and Diane to the Pacific Northwest. He later moved on to Piper Jaffray, where he worked for many years until he attempted retirement in 1992. Shortly thereafter, he returned to the investment business to start a new firm, Morton, Clarke, Fue, and Metcalf, with some friends from Kidder Peabody. Al loved the friendships he made in the municipal bond community. It was a time before electronic trading, when your word to someone over the phone was your reputation. He served on the organizing committee of the Washington Bond Club annual outings at Rosario on Orcas Island, where he oversaw the infamous 'WPPSS' Auction and participated each year in the 'Great Orcas Island Foot Race.' Al was deeply committed to the growth and development of Seattle Opera and served on its board for many years. Al loved to walk through the Pike Place Market and explore the variety it offered. He was drawn to the work of the Pike Market Clinic. He served on its board for a decade and contributed his time and financial support to the Market Foundation. After his first marriage ended, Al married Seattle attorney Sally Clarke in 1988. In retirement they both took up golf and enjoyed the slower pace and warmer weather in Tucson, Arizona where they have spent the winters for many years. Al is survived by his wife Sally Clarke, daughter Heather Shaw, sons Scott (Jennifer) Roberson, and Alan (Karen Robertson); seven grandchildren and one great-grandchild; and brother Brock Robertson. He was preceded in death by his former wife Diane, and brother, Alexander Robertson (SPHS '47).